I designed, developed and patented a very innovative fence mowing device that MOWS UNDER FENCES, and around Fence Posts Easily, it's a real Fencehog! Need to maintain up to 2 to 3 miles of fence per hour? Fence Runner mows under fence and when it approaches post, tree, or other vertical obstruction, Fence Runners patended spring loaded deck eases around the fence post. Just drive parallel to the fence and after the deck passes by the tree post or other vertical obstruction the deck returns to mowing underneath the fence. ALL you do id drive parallel to the fence and Fence Runner mower's spring loaded deck does the rest! YOU CAN MAINTAIN 2 TO 3 MILES OF FENCE PER HOUR!! 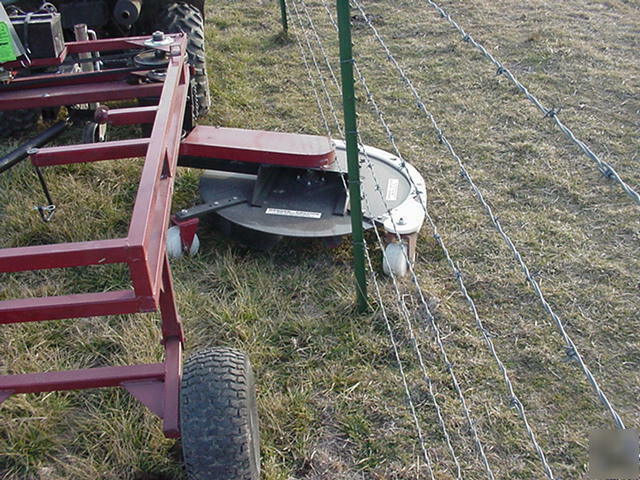 FENCE HOG TOWS BEHIND ATV, LAWN MOWER, OR SMALL TRACTOR. WITH THIS SELF CONTAINED UNIT ALL YOU NEED IS A HITCH PIN! 3. Rigid 33 inch blade for cutting short or tall grass, weeds, blackberry briars, small sprouts and trees, etc. 4. Adjustable deck spring tension to adjust the amount of pressure that is takes to retract the deck to go around fence posts but still cut tall vegetation. Call us for a free 30 minute video or email can be picked up at our facility in Lamar, Mo. southwest Mo. Lamar about 120 Miles south of Kansas City. Weighs about 700 pounds crated.